Brightwood Vineyard and Farm is a diversified family farm in Madison County, Virginia, in the foothills East of the Blue Ridge Mountains. We raise laying hens and sheep, as well as a variety of Certified Organic berries, vegetables and herbs. We also produce value added products and entertain guests at our B&B Cottage. We offer a wide range of elderberry and elderflower products: jam jelly, syrup, wine and non-alcoholic cordial. 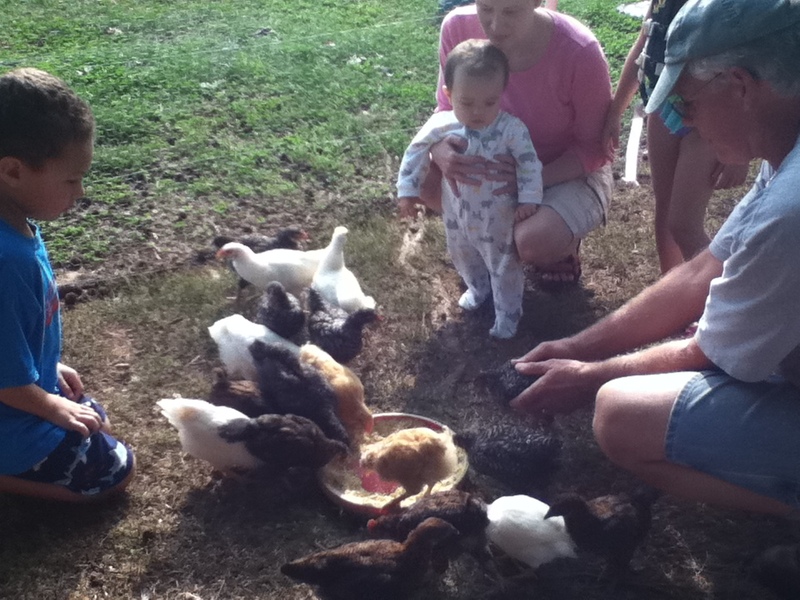 Our farm brings the animals from your children’s stories to life! On Farm Tour day our new chicks will be 2 months old, new lambs a month and a half, and Arthur the jersey steer calf 3 months old. Leia and Quade, our Great Pyrenees guardians and donkeys Sadie, Rosie and Isabel all love company. Cara, our English shepherd will greet you on arrival. We look forward to your visit. Tours ongoing between 10AM and 2 PM. Meet our Farm Animals: Wear sturdy shoes for a walk among the animals in our pastures. Every half hour and as groups form between 10 am and 2 pm. Meet Yer Microbes 🙂 Meet some of the unsung heroes on our farm, the little guys that give our produce more flavor and make it better for you. They’re not as flashy as our big guys, but beneficial microbes are the solid foundation of all we do here. We’ll go on a “microbe treasure hunt” and zoom in for a closer look. Appropriate for inquiring minds of all ages. Jams, jellies and wine from our organic fruit. Herbal teas, fresh raspberries, produce and herbs in season.